(CNN) -- Alan Shearer's Newcastle United side are back in the bottom three of the Premier League after a 1-0 home defeat by Fulham on Saturday -- and they will be relegated if they lose their final match of the season at Aston Villa next Sunday. 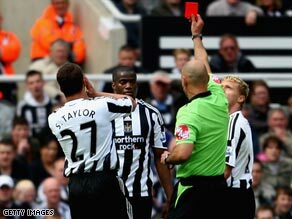 Newcastle have Sebastien Bassong sent off as they slump back into the Premier League drop zone. Diomansy Kamara fired home the only goal of the game in the 41st minute, his third goal in two games after a long injury lay-off, while Newcastle finished with 10 men after Sebastien Bassong was sent off for fouling Kamara when the Senegalese striker was through on goal. Newcastle had moved out of the relegation zone with a 3-1 win over fellow- relegation rivals Middlesbrough on Monday, but they were unable to build on that display on a rain-swept afternoon at St James' Park. Meanwhile, Fulham consolidated seventh place in the table, and they will be playing Europa Lague football next season if they draw at home to Everton next Sunday. Saturday's results mean any three from five teams can still get relegated from the Premier League this season. West Bromwich Albion are bottom of the table with 31 points and will be relegated if they lose at home to Liverpool on Sunday. However, a draw or a victory keeps them in the hunt. Meanwhile, Middlesbrough's situation looks particularly bleak after they were held 1-1 at home by Aston Villa. Turkish midfielder Tuncay put them ahead but John Carew's equalizer gave Villa a point. That means Middlesbrough are on 32 points and must win at West Ham next Sunday, and hope Hull lose at home to Manchester United to have any chance of survival. Even those results might not be enough, with Middlesbrough four goals worse off than Hull. Newcastle are third bottom on 34 points, while Hull have clambered out of the bottom three on 35 points after a 1-1 draw at Bolton. Gretar Steinsson's deflected shot put Bolton ahead but Craig Fagan's vital goal, following a Danny Shittu error, earned Hull a point. A win against a Manchester United side, who could have one eye on the Champions League final, will keep Hull in the Premier League. Sunderland are also still in danger on 36 points. They need a win from their visit to Portsmouth on Monday, or home game with Chelsea next weekend, to be sure of survival.